WDAE is the first station to operate in Florida. The station was authorized, and began broadcasting, on May 15, 1922. However, records of the Department of Commerce show that WCAN in Jacksonville, licensed to Southeast Radio, was authorized on May 8, 1922. According to a web page about Jacksonville radio history, WCAN went on the air in August 1922. For its fiftieth anniversary, WDAE received a letter from the FCC confirming WDAE's status as the "first radio station to begin operations in the state of Florida." The following is taken from "WDAE, Florida's Pioneer Radio Station" by Hampton Dunn. By 1922, the papers in Florida were giving more attention to the subject of radio. In February, announcement had been made that a permit to build and operate a radio station had been granted to The Tampa Daily Times. On April 1st that year, The Times started a "Department of Wireless" in its columns, edited by Jack Landon, who answered questions in the paper regarding radio and the home building of radio receivers. Then on May 1st, John. 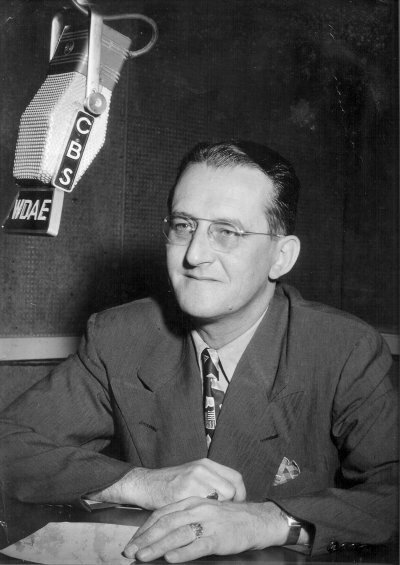 V. L. Hogan, nationally known radio engineer, appeared in the columns of The Times conducting a similar feature. World War I had left quite a few Naval and Coast Guard installations of radio in Florida. This equipment was very crude and was used mostly for radio telegraph communications, but many fine and sincere young men, working in these conditions, were interested in the new art and hoped to make it a peace time occupation. Among these was one Harold McClung, who had been attached to the Naval radio station at St. Petersburg. Mr. McClung shopped around and assembled the necessary equipment to build a broadcasting plant. He first approached the University of Florida to sell them the equipment. They were not interested. In December of 1921, Mr. McClung approached the management of The Tampa Daily Times, which was then owned by Col. D. B. McKay, and offered to install and sell his broadcast equipment to The Tampa Times. The management of the paper was definitely interested in this new art and immediately concluded the deal with Mr. McClung and filed an application with the Department of Commerce, which was then the licensing authority for radio. 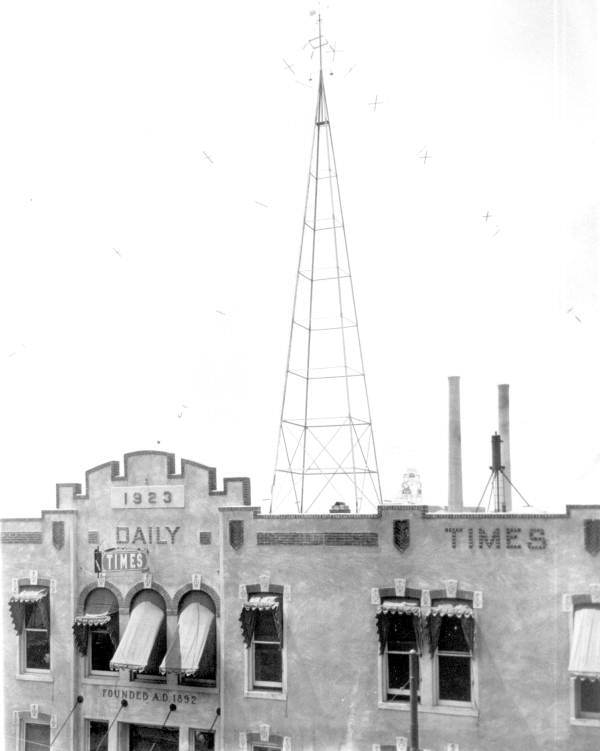 On Feb. 12, 1922, authority to erect and operate a radio station was received by The Times. But simultaneously something new was added to the young man's life: romance. This offset to some extent Mack's interest in the air waves and, in addition, brought on a need for extra money. Mack decided to cash in on his home-made transmitter and began peddling it about. One of the first prospects was the late Charles G. Mullen, general manager of The Tampa Daily Times. But it was all so ephemeral, Mr. Mullen was just not interested. Love is a potent factor, however, so the persevering swain solicited the University of Florida. He found educational moguls there with the foresight to be interested but with nothing in the college budget for such an unprecedented venture. As they bickered, Mr. Mullen had a change of heart, sensing publicity advantages in the contraption, with the result that The Times purchased the transmitter. 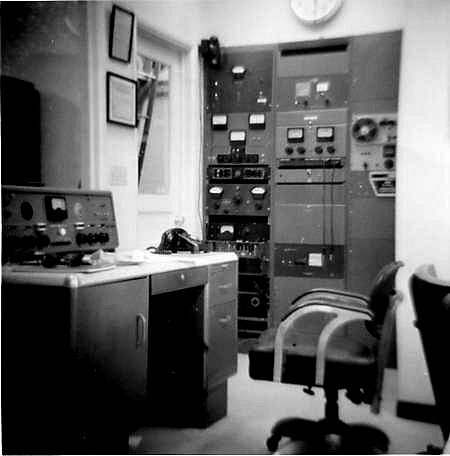 As soon as authority was received from the Department of Commerce, plans were pushed for getting the station on the air. A studio was rigged up in one of the rooms of the Citrus Exchange Building (now Maas Brothers Building) and the broadcasting equipment on the roof, with the aerial wires strung around the cornice, here and there. 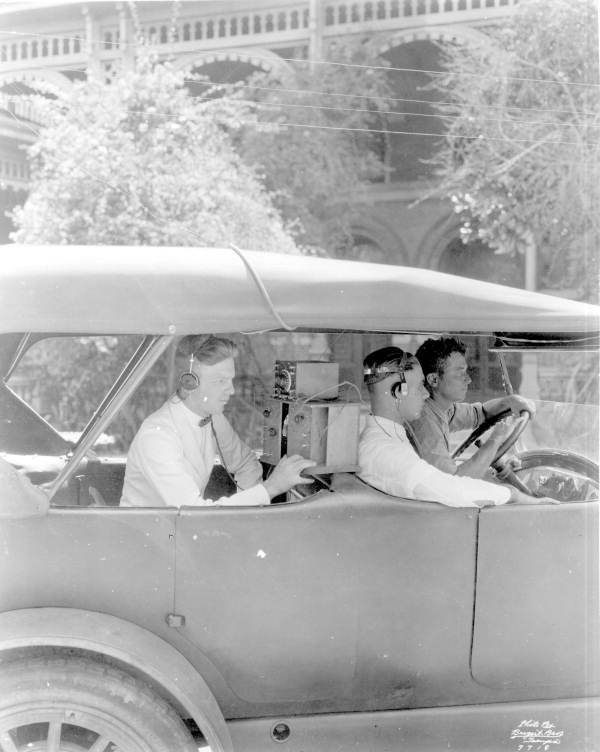 By this time, W. R. McDonald and G. C. Warner, well known radio operators had been engaged to operate the new station. In April, 1922, air tests began. On May 17, a telegram was received from Washington bearing the good news that a license had bene issued and announcing that the call letters WDAE had been assigned. Local radio fans were advised to "make a note of those letters." On Monday, May 15, the birthdate of the station, The Times had requested all owners of sets in this section to "please stand by" from 7 to 9 P. M. for the next three nights, to see if they could hear anything. "Tell us how your reception of our radio station is," the announcement read. "Let us know if you hear any 'buzzing noises.' That is static." And that night the station went on the air, unofficially. In the tests the day's baseball scores were broadcast, and several phonograph records were played. "Of course," it was necessary to apologize, "things will be working better after awhile. It takes several days to tune up the transmitter machinery properly. Stand by again tomorrow night." 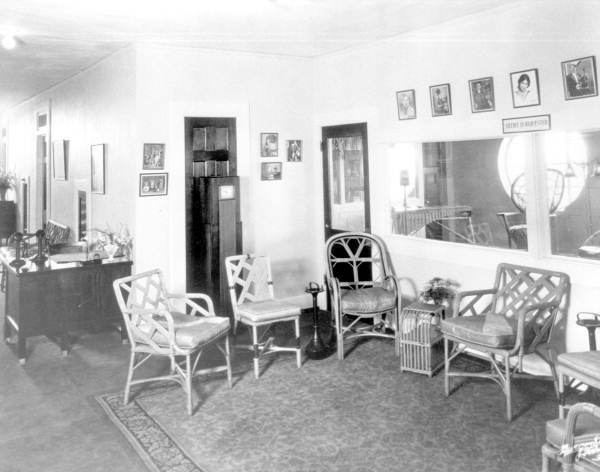 The first studio was a simple affair. 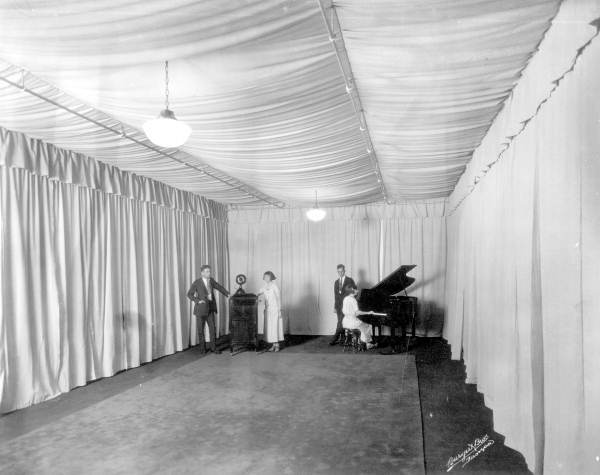 A small room, with a microphone hanging from the wall. That's all it was. In an adjoining room was the transmitting machinery, also simple. View of the WDAE Egypt Lake transmitter site, 1960s. Photo courtesy of Ron Gurley. The following is the FCC microfiche file on WDAE, transcribed by Xen Scott on August 2, 1994. Co.(Tampa Daily Times). The station was located in Tampa, FL. 4/23/27  Granted a T.P. for 1100kc with 500 watts. 6/1/27  Granted 1120kc, 500 watts. 11/11/28  Reallocated to 620kc, 1kw, shared with WDBO. 3/2/34  Vol. assign. of lic. to Tampa Times Company. 4/3/36  Granted a C.P. for 1220kc, 1kw, 5kw LS. License to cover the C.P. 12/5/39  Granted a C.P for 1220kc, 5kw DA-1. License to cover the C.P. 3/28/41  Under NARBA, they were granted 1250kc with 3kw, 5kw LS. 4/9/42  Application made for 770kc, 5kw DA-N. Denied 6/30/42. the request of the station's attorney. 6/15/59  Vol. assign. of lic. to Smiley Properties, Inc.
10/28/64  Vol. assign. of lic. to Rounsaville of Tampa, Inc.
3/15/79  Vol. assign. of lic. to Taft Broadcasting Co.
12/4/80  Granted a C.P. for 1250kc, 5kw DA-N. This article appeared in the Tampa Daily Times on May 15, 1922. Radio fans of Florida! Attention! Radio fans of all parts of the state of Florida are requested to assist the Times to test out its broadcasting station. "Stand by!" From seven to nine o'clock Monday, Tuesday and Wednesday evenings, and notify The Times of the results. The Times wants to know how you hear its station. Do you note any buzzing? How is the "static"? The Times will test the station for these three days before beginning its regular programs. Also fans of the state are hereby informed that The Times has been notified by the Department of Agriculture that it has been granted a license to broadcast weather forecasts and special weather information on a wavelength of 485 meters. This means that The Times broadcasting station becomes an official weather station of the United States government and will be recognized as such. All regular daily reports and special reports throughout the state will be sent out by The Times. In case of any serious weather disturbances such as storms and the like, the station will be kept open both day and night, keeping farmers, truckers and shippers posted with the latest developments. Monday, Tuesday and Wednesday nights from seven to nine o'clock. Drop The Times a card telling how satisfactory results are. This article appeared in the Tampa Daily Times on May 16, 1922. Monday night the Times radio station was tested for the first time by W. R. MacDonald and G. C. Warner. Both these experts in radio work took their position in the broadcasting room on the sixth floor of the Citrus Exchange building and from 7 until 9 o'clock tested the apparatus for transmission of messages. All radio fans in the state of Florida were asked to stand by during this time and to listen how the messages were heard and to report at once to the Times just how the broadcasting was working. It takes several days to tune up the transmitting paraphernalia properly and therefore again on Tuesday and on Wednesday nights the Times will test its outfit from 7 till 9 and again asks all fans to stand by during these hours and report results either by 'phone, letter or post card. On Monday night the Times sent out the baseball scores and played several records on a phonograph and also sent out as tests several items of news. Tuesday night a more thorough test will be made and more information will be broadcasted for testing purposes. WDAE tower, on Franklin Street at Washington Street. Photographed on April 3, 1924. WDAE waiting area and studio. Photographed on April 2, 1924. Employees at work in the WDAE radio studio. Photographed on April 2, 1924. Kenneth Skelton at the WDAE microphone. Mr. Skelton was born in England and worked for the BBC before coming to the U. S. Photo courtesy of Mark Skelton, his grandson. This article appeared in the St. Petersburg Times on Jan. 14, 2000. A big AM radio dial swap takes place tonight at 6:20 p.m. All programming currently heard on WDAE-AM 1250 (The Sports Animal) will move to 620 AM, allowing for a stronger signal for the Tampa Bay Lightning games and other team sports. CNN Headline News, most recently heard on 620, moves to WTBN-AM 570 (formerly WHNZ). The programming now on 570, mostly infomercials supplemented by network talk shows, moves to the new WHNZ-AM 1250 (formerly WDAE). The shakeup is the result of Concord Media Group's swap of WSAA-620 with Clear Channel Communication's WHNZ-570. Changes were supposed to take place the first of the year but were held up as station owners finalized arrangements and awaited government approval.